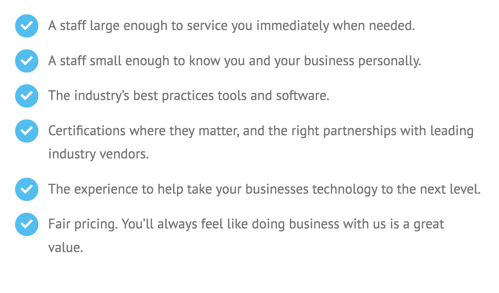 Let us come show you how we can help make your business IT better! Do you only ever see your IT professionals when you have an IT emergency? With a managed IT service relationship, we'll work for you constantly to prevent emergencies, keep your data secure, and help your business systems run better. Talk to us learn more about the features we can include in our managed IT services plans, including our 24/7 monitoring and service options. We will customize a plan to fit your business, with the service options and price point that is perfect for you. Complete the form to the right to be contacted right away!